Everything is better with Star Wars. Anyone that's ever cut a graceful arc through the air with a vaguely saber-shaped object while making whooshing noises knows this. Dogs know this. Pizza lovers know this. Even Disney know this. Anyone can toss a tan robe on their pet or Photoshop a lightsaber into their prom photo, adding significant value to otherwise useless things, but the most successful Star Wars crossover creations incorporate distinctive elements of the science fiction fantasy epic in a more mechanical fashion. Eating utensils that require the focus of a Jedi lest one's meal give in to hate and fear. Camping gear that simulates the warm innards of a recently-deceased riding beast. And yes, Angry Birds Star Wars. Angry Birds Star Wars takes the best elements of the original physics flinger and the gravity-powered gameplay of Angry Birds Space and transports them to a long, long time ago in a galaxy far away. The game opens on Tatooine, where the young nephew-bird of moisture farming birds dreams of adventure among the stars. Instead of sitting about whining about it, he throws himself at some pigs wrapped in mummy bandages. In a way it almost transcends the original work. Luke begins life (lives, really) as a simple red bird, stumbling blindly through dangerous situations. He has no special powers, just raw potential that remains untapped until he meets good old Ben Kenobi. The introduction of his Jedi mentor triggers an evolution in Luke's bird-persona, granting him the power to swing his newly-acquired lightsaber in a destructive arc, destroying objects and any unfortunate Imperial forces that stand in his way. This evolution is an extremely clever way to translate the character development from the first Star Wars movie into Angry Birds form. Remember Ben Kenobi's line from the film during his confrontation with Darth Vader on the Death Star? "If you strike me down, I shall become more powerful than you can possibly imagine", he warns his former pupil. After the first Vader level in the Death Star portion of the game, the Ben bird's force push ability doubles in strength. More powerful indeed! The Star Wars connection strengthens the traditional Angry Birds formula in unexpected ways. On certain levels angry red blaster bolts fire at regular intervals, adding a dodging element. Luke's lightsaber can deflect these bolts, sending them shooting off destructively in random directions. Latter levels see Darth Vader's avian counterpart suspending objects above the playfield via the Dark Side of the Force. Taking him out sends them plummeting to the ground, killing any hapless Snouttroopers in their path. 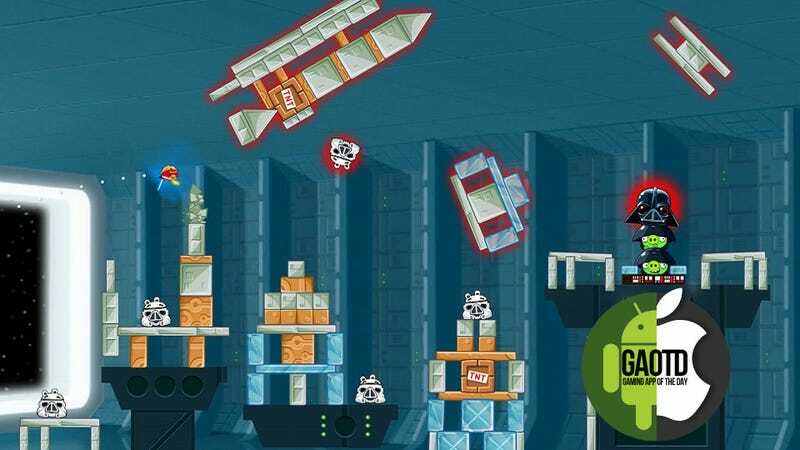 With 40 Tatooine levels, 40 Death Star levels, the promise of a free set of Hoth levels in a future update and a handful of secret Golden Droid stages, Angry Birds Star Wars continues Rovio's trend of delivering ridiculous amounts of content for a tiny price—Android gamers don't even have to pay, leaving them free to drop $1.99 on the 40 Dagobah-themed "Path of the Jedi" levels available for in-game purchase. Angry Birds Star Wars is more than a Star Wars-themed Angry Birds game—it's a Star Wars-enhanced Angry Birds game, the two elements combining into something greater than the sum of its parts.